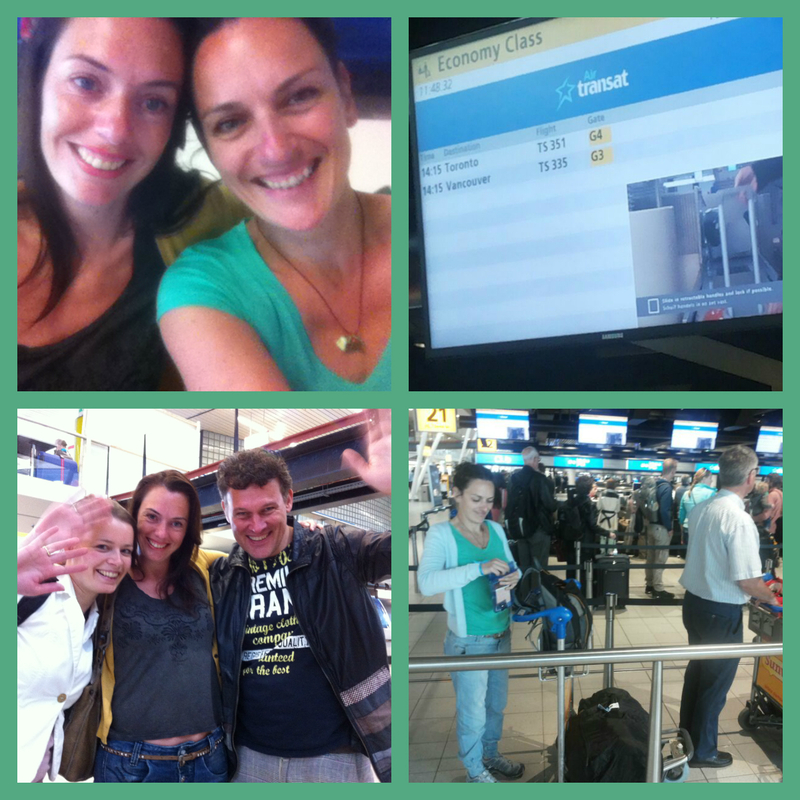 After a warm farewell at Schiphol Airport I confidentely walk through customs, yes I still can wave to my sister and friends, ah, just one more glance, yes, I can still see them, and then, ok now, turn around, and I’m off, briskly making my way to the gate. My flight to Vancouver, Canada is packed with pensionados, retired people on their way road tripping the Trans-Canada Highway in their rented RV’s and motorhomes. I feel tired and not in the mood to chat up with the grey couple sitting next to me. Their kids and grandchildren are accompanying them on this flight. They’re setting out on a family holiday. My God, those are the bravehearts! After a 9 hour flight, I walk smoothly through customs and collect my bag, and there’s my friend Carla, a Dutchie who lives on Vancouver Island and whom I met years ago, in another stunning part of the globe, Tibet. She looks great and it is great to see her again! In the days that follow I try to diminish the jet-lag effects (my biorhythm is stuck somewhere halfway above the Atlantic Ocean) but I’m still on Central European Time, which means that I have to struggle not falling asleep before 7 PM and most of the nights I lie fully awake at 3 in the AM. Luckily, the effects are slowly wearing off, and after 4 days my body is on Pacific Time, full on. Thank God for that! Carla and I working our way through a busy schedule. We’re preparing for our first trekking, where we have exactly 2 days of preparation time for. We shop until the credit cards max out at MEC where we indulge ourselves with camp-goodies, ultra-light must haves and pepper spray to protect ourselves against bears (and scary men). We shop for groceries, deliberating while racing the shoppingcart through the store what to bring (nutricious and delicous foods) and what not to bring (heavy cans and soft fruit). Ziplock bags are becoming my new favorite item. Actually, they have become my new favorite item of 2014. Oh, and crisps too. And dried sausages. Yes, I stepped on the meat wagon again. Meat. Such. Good. Energy. Especially for hiking. So I allow myself eating everything I want this season. 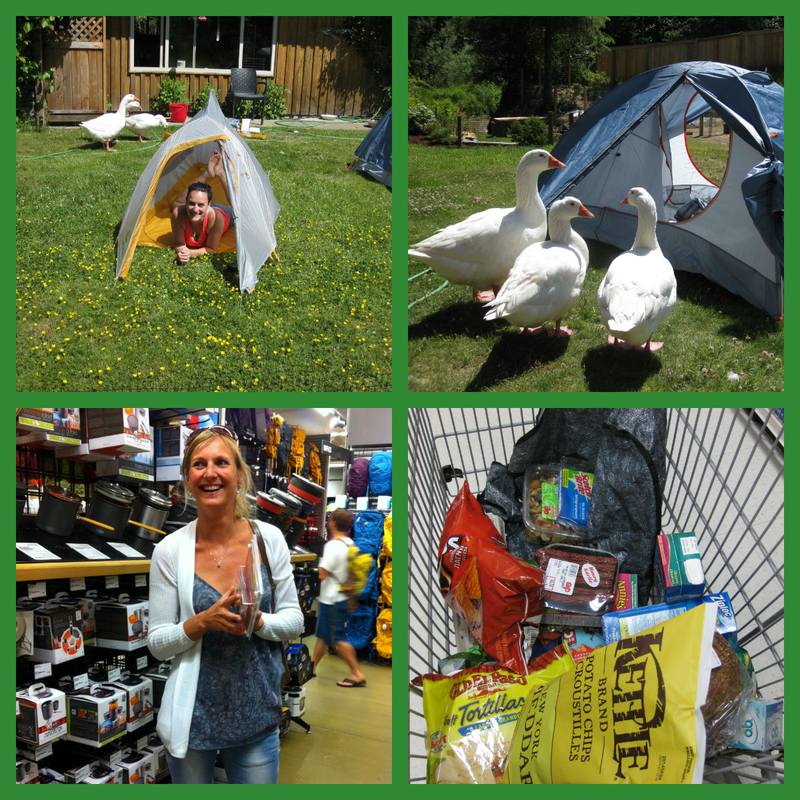 At home, we’re having fun setting up our new tents, and the geese are loving it too! We’re so ready to rock the mountains! Total pensionados on the plane: too many. Total amount of consuming meat and fish for dinner: I think almost every night. It must be. Total trees here on the island: trillions? It’s so green here! Total times I gaze in complete awe at Vancouver Island’s scenary: countless. Hey Viola, nice reading you’re blog! And I have to let you know, besides eating meat, think at oats 🍜🍜🍜🍜🍜. I’m looking forward to you’re blog about the first steps/ day of you’re walk. But a good preparation is 50% of a succes. Enjoy!!! You write SO funny. It makes me laugh. I’m SO happy you’re here in Canada now. Great times.